Tesla has faced a series of roadblocks, including investor concerns surrounding production and demand — specifically around its Model 3. But arguably the most pressing issue is the intense brain drain. Last month, Tesla (TSLA) laid off around 3,000 employees, or about 7% of its workforce. And while job cuts and Musk’s mercurial nature have captured a lot of the spotlight, the high-level turnover at Tesla has reached a fever pitch over the last year. A head-spinning number of top employees across all departments, including engineering, legal, finance, sales, human resources, and communications, have quit the company. 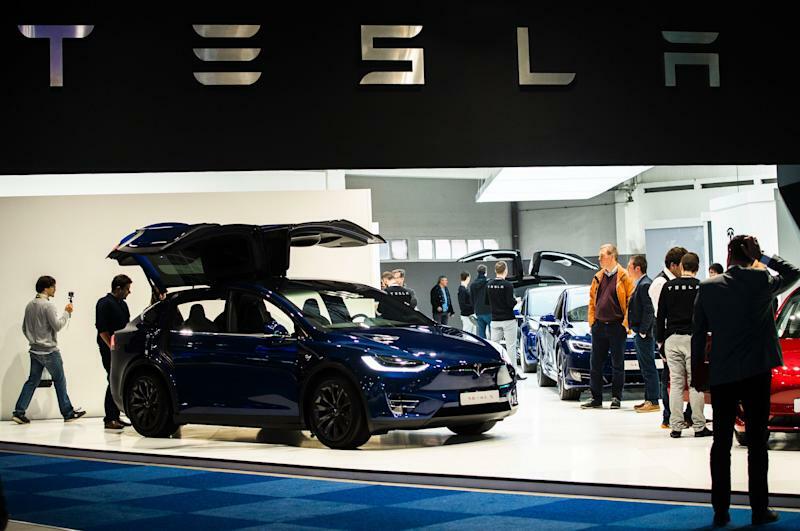 On Wednesday, the electric carmaker said its general counsel Dane Butswinkas is leaving the company after just two months on the job, joining a steady flow of high-profile departures. 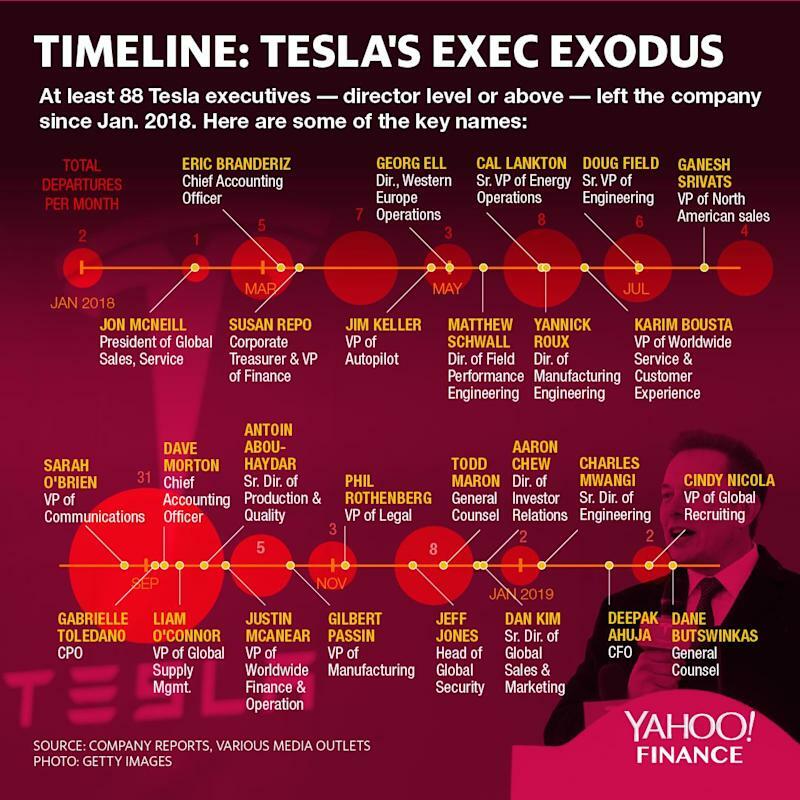 A Yahoo Finance investigation found at least 88 Tesla executives have left the company since January 2018. Tesla shortseller Jim Chanos pointed out that Tesla cut 9% of the workforce in June 2018, the same month 13 executives left the company. Sixty people have departed since the start of the third quarter of 2018, with 30 leaving in September 2018 alone. Executives are defined as director level or above; the list would be significantly longer if we included managers. Despite two consecutive quarters of profitability, Tesla posted lower-than-expected earnings in the fourth quarter. The company has yet to turn an annual profit, losing $976 million in 2018. Nevertheless, much of the financials were overshadowed recently by the Jan. 30 announcement that longtime CFO Deepak Ahuja would be leaving for good. Ahuja had first joined in 2008 prior to Elon Musk becoming CEO, retired in 2015 — then returned to the role in February 2017. And that’s not even the most recent exit. Just this week, it was reported that Tesla’s head of global recruiting, Cindy Nicola, will be leaving the company after nearly four years. Tesla confirmed her departure to Yahoo Finance and said this would be her last week at Tesla. Prior to that, Jeff Risher, chief intellectual property and litigation counsel, left the company in July to join electric vehicle startup Faraday Future in a similar role. He added: “I want to be clear that I believe strongly in Tesla, its mission, and its future prospects, and I have no disagreements with Tesla’s leadership or its financial reporting.” Despite his denial of any conflict, the abrupt exit was a red flag for investors. Shares of Tesla fell 6% on the news. A day after Morton joined, Musk had tweeted that he was “considering taking Tesla private at $420” in his now-infamous “funding secured” claim. Shortly after, Musk joined Joe Rogan in a bizarre podcast during which he appeared to smoke a joint. Musk and Tesla were charged with civil securities fraud by the SEC and had to pay fines of $20 million each. Musk was also forced to step down as Tesla’s chairman for three years as part of a settlement with the SEC. After leaving, Morton joined software company Anaplan (PLAN) as CFO. A few days after Morton’s departure, two key executives followed suit. Bloomberg reported that Tesla’s Chief People Officer Gabrielle Toledano, who had been on a leave of absence, would not be returning. She’s now executive-in-residence at Comcast Ventures (CMCSA). Tesla’s Head of Global Finance Justin McAnear also tendered his resignation to become CFO of 10x Genomics, a gene sequencing startup. Tesla lost several key executives throughout November and December, including VP of legal Phil Rothenberg, head of global security Jeff Jones, director of investor relations Aaron Chew and general counsel Todd Maron. 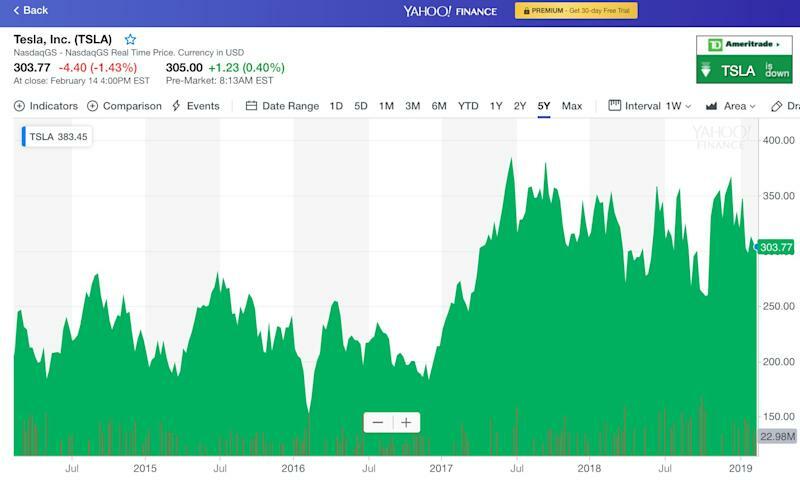 While it’s indisputable that Tesla was the first commercial and mainstream mover in the electric vehicle space, this executive exodus could be having material impact on the stock and investor sentiment. Musk is already widely reported to be a poor delegator, which is both confirmed and hurt by the fact that executives are leaving in droves. Just this week, it was reported that Amazon (AMZN) and General Motors (GM) were looking to invest in Detroit-based startup Rivian, which specializes in electric pickups. These gaping holes in Tesla’s leadership could embolden not only new players but also the likes of Audi and Mercedes that have been aggressively trying to gain more market share. Tesla declined to comment on the wave of executive departures. Melody Hahm is a senior writer at Yahoo Finance, covering entrepreneurship, technology and real estate. She hosts Breakouts, a monthly interview series for Yahoo Finance featuring up-close and intimate conversations with today’s most innovative business leaders. Follow her on Twitter @melodyhahm.